‘It will all be over by Christmas’. That was the popular phrase in the Autumn of 1914 after war had been declared in August. But it wasn’t, and this came as a surprise to most people including the War Office, but not the Navy. Since 1908 the Admiralty had been actively employed in building new powerful warships. Companies such as Allens were already busy supplying machinery to the shipyards of Britain. In 1914 the company employed around 1300 men with 50% of production going to Admiralty contracts. The rest of the production was for the merchant marine and for land based plant. Within a few weeks of the outbreak some 300 men left to join the colours. The company was generous to those men who joined up and paid them half pay while they were away. Provision was made for the widows of men killed. The War claimed the lives of 32 employees. Most of the steam driven machinery at the outbreak was reciprocating engines, but in 1913 a licence agreement was signed with Parsons in Newcastle and this saw the design and production of steam turbines for auxiliary power units commence in Bedford. A new turbine shop was established and production of Allen turbines continues to this day in Oakley. 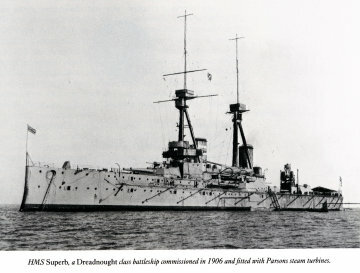 In 1915 the whole of the companies production was given over to the requirements of the Admiralty and this involved them in the manufacture of machinery not previously made. The Admiralty requested Allens to undertake the manufacture of solid injection air blast diesel engines for submarine main propulsion duty. These were an 8 cylinder Vickers design producing 800 hp at 380 rpm. Allens completed their first engine in eight months but only went on to build a total of three. They also went on to build 16 sets of 3500 hp geared steam turbine units for patrol boats, 24 off 1100hp triple expansion steam engines for minesweepers and 14 sets of 450hp steam engines for trawlers, as well as many smaller compound steam engines for launches and pinnaces. 645 sets of steam engines and generators ranging from 20 KW to 200KW capacity. 581 sets of steam engine and steam turbine driven pumps from 6” to 35” diameter. 749 sets of steam engine and turbine driven fans from 68” to 88” diameter. Surprisingly at the outbreak of the war no British built military aircraft were using British built engines. Only the Sunbeam company supplied any by the end of 1914 but only 100 units. The main aero engine of the day in 1914 was the French Gnome rotary engine of 50 hp. This was being made under license in France and Germany prior to hostilities and most of the planes on both sides were using the same engine. In November 1915 the War Office, now starting to catch up, placed an order on Allens for 100 off 80hp Le Rhone versions of the Gnome rotary engine. Much rearranging of the Queens site was undertaken, but more space was needed. A 20 acre site at the far end of Ford End Road, in Biddenham, was bought for £6000 and this was cleared and in production within three months. The site initially had a brass foundry. To this was added a Smiths shop and an Iron Foundry. A new office building was added together with a canteen making the site fully self contained. All this by the end of 1916. All the buildings were designed by George Pemberton Allen, William Henry’s second son, a trained Architect, who supervised the whole construction. The removal of all the dirty and noisy stages of production to Biddenham works greatly improved the cleanliness at Queens. The first engine was delivered in March 1916 and during the next two and a half years 3,221 engines were delivered. In 1917 the output was increased to 110hp. Allen built engines were used in the DH5, the Sopwith Scout, the Bristol Scout and the Avro. National Museums Scotland – Le Rhone aero engine was made in 1917 by W.M. Allen & Co Ltd. It was mounted on an Avro 504 two-seat training aircraft. 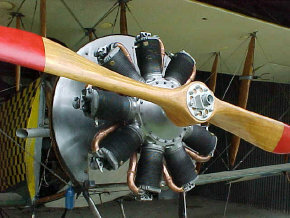 It is shown mounted on a frame supporting the nose section of the Avro 504 and is cutaway to give an impression of how a rotary engine works. As soon as the Armistice was signed in 1918 all the orders were cancelled. 500 women employees were laid off and the aero engine department closed down in 1919. During all this manufacturing there was intense design work going on to improve the products and to develop new ones. It was a period of massive changes in the technology of the day and Allens with their history of training and technical innovation were well placed to lead many of these changes. Many of the senior staff became acknowledged experts in their field and they presented many papers before the learned Institutions. Towards the end of the war William Henry was invited to become the President of the Institution of Mechanical Engineers. Due to ill health he was obliged to turn it down, but some of his offspring took up the same position in later years. Amid all this manufacturing the means of production was under great pressure. There was an acute shortage of skilled labour. Women were introduced into most departments including the brass and iron foundries where they made cores and fettled small castings. At the end of the war Allens employed 3,394 persons of whom 1,034 were women, most of whom worked in the machine shops and on the assembly of the Le Rhone engines. 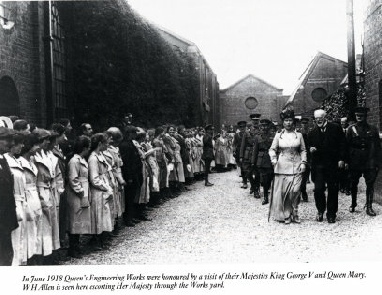 In June 1918 King George V and Queen Mary visited the company and spent an hour touring the works. The day after the royal visit the company announced the establishment of a new recreational club on a 10 acre site west of the Biddenham works. Sporting a cricket pitch to ‘county standards’ and a new pavilion the facility provided the employees and their families access to a wide range of sporting and social activities. This sports ground, known as Allen Park, was given to the local council in 19?? and is still in use today.